Forecourt operators can make use of a multitude of point of sale products. From the largest forecourt poster sign to the smallest counter top leaflet holder, a huge range of promotional displays are available to impact footfall, impulse purchases and profit. 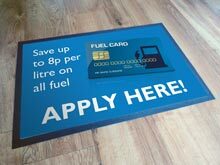 Large format signs are tried and tested favourites with forecourt operators with poster and panel options to cater for both permanent and tactical messaging. The Sentinel, Cyclone 2 and Sightmaster 3 large format signs are the most popular forecourt solutions for displaying large format (A1 plus) outdoor poster messaging in a safe, attractive and easy to use way . The largest of these portable signs stand above average head height and are large enough to provide clear long distance messaging even for the fastest approaching motorist. Sentinel uses magnetic framed cover sheets to display and protect posters, whereas Cyclone 2 and Sightmaster 3 uses outdoor specification front opening snapframes each side. Both systems offer quick and easy poster change and good levels of poster security and weather protection. The Sentinel sign also has the option of banner display – held in place by elasticated banner ties. The back panels of each poster sign are suitable for print or vinyl application for a more permanent display solution when posters are not in use. The tough moulded bases on these products are empty for ease of transport and handling but must be water-filled during use for optimum performance and safety. Designed with in-built wheels one person can easily reposition the sign when full with the Signwaves Trolley (sold separately). Petrol forecourt operators often have fresh food and drink available to take away. Hungry passing trade will find it difficult to resist high definition, photographic prints. Digital printing is the best way to achieve this. Signwaves offers digital print in-house at competitive prices. Custom shaped panels will also bring these prints to life – consider shaped Ecoflextra panels or the supersized POW! 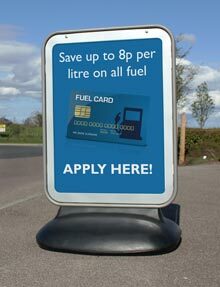 forecourt sign for the highest impact. In its largest configuration POW! can measure up to 6’4” (nearly 2m) in height. Panels for both Ecoflextra and POW! are easy to switch, taking less than two minutes, and can be bought as standalone replacements without the need to purchase another base. Flying Banners can capture attention on the roadside through height and movement. Teardrop banners may be the preferred solution for forecourts, as they will rotate but not flutter. Fast moving traffic with shorter attention span should therefore find the artwork easier to register. Additionally flags that don’t flutter put less stress on the flag fabric and should last longer – an important consideration in an environment where operators are unlikely to bring the units in at night or during bad weather. For such situations Signwaves always recommends reinforced elasticated sleeves on the banner flags for maximum strength. Petrol forecourts often have shops with glass frontages. Many displays are suitable for glass mounting, including: Open/Closed Signs, Headliner poster displays, Window Stickers, Labels and Graphics, and the NoScrewz Flag with its revolutionary twist suction mounting bracket . These and functional display products are especially useful when floor space is at a premium. Placing a Feature Floor Mat immediately by the entrance turns the floor into further advertising space, whilst providing a practical solution to help keep the shop floor clean! With multiple facilities and services on offer, petrol and forecourt operators can’t afford to compromise on effective signage and displays. Whether it’s capturing passing roadside trade with forecourt or pavement signs, or discovering untapped promotional opportunities in store, Signwaves has a wide range of point of sale solutions to meet display needs both in-store and out.